One of my favorite ways to explore new countries is by taking a cruise. 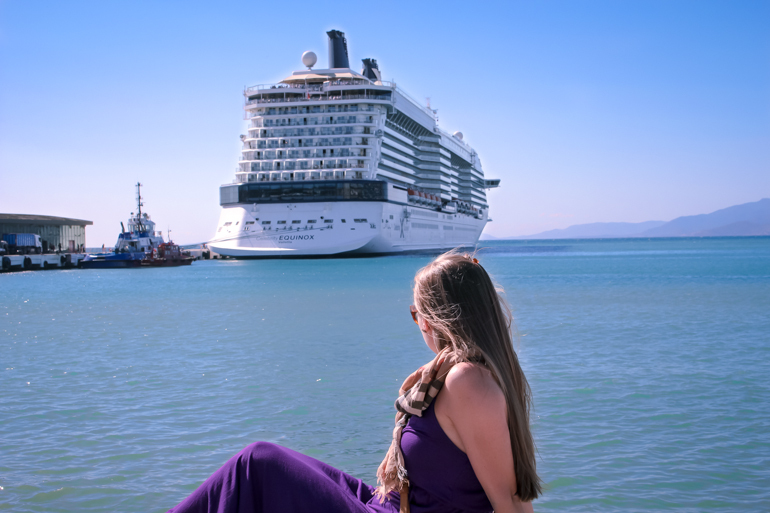 Eugene and I have been on several cruises over the last few years, so I decided to do a flashback post to one of our favorites: The Mediterranean Cruise on the Celebrity Equinox that we took in May of 2014. While looking back at our pictures from this trip, I couldn’t stop laughing. Eugene and I look so young! Please enjoy our baby faces. I highly recommend cruises for all travelers, especially to explore Europe, as you get to see a lot in a little window of time. I know cruising is not for everyone; however, it’s a great combination of adventure, relaxation, and luxury. If you’ve never been on a cruise, or are debating taking one, do it. When choosing our cruise, we were reviewing several different boats and destinations. We finally decided on the Equinox because the stops suited us the most and the ship was a newer build. I’m delighted with our decision to sail on the Celebrity Equinox, and I would do it again. The vessel was gorgeous, clean and we were extremely impressed with the service onboard. These ships are crazy large, and this one had enough capacity for 2,850 passengers! Onboard amenities included multiple restaurant options, several bars, a theater, pool, and sundeck. The ship was voted “Best Overall Cruise Large Ship” by Cruise Critic Cruisers’ Choice Awards in 2015. While the boat was perfect for our European adventures, I do prefer cruising with Royal Caribbean to the Caribbean. Their ships have much more in terms of onboard activities and amenities, including an ice-skating rink, rock climbing, zip lining, and skydiving. On a Europe cruise, these amenities are not as essential because you don't spend that much time onboard. Each day we were in a new city from the early morning to late at night. While we were at port, we had a lot of options for excursions through Celebrity. We didn't plan any tours before sailing and booked everything onboard. I don't recommend this because you will most likely pay more onboard. For our next Europe cruise, which we have scheduled for summer 2018, I plan on booking all of our excursions prior to sailing either through the cruise line or Viator.com. Check out my favorite resources blog post if you haven't already. Shore excursions are expensive and not a must, but I love having everything planned out for us. Keep in mind- you don't have to book your tours through the cruise line. There are a ton of sites and companies to book through. One reason I usually prefer to book through the cruise line is because of any timing issues. The cruise tour companies will stick to the cruise line scheduled times and ensure you don't have a late return. I'm not sure how accommodating the other companies may be. Some of the cities we visited it was effortless to get around without a tour, others it was a pretty big hassle because the ship ported hours away from the central part of the city. This cruise was also our first sailing where we booked a balcony room. Honestly, this was the best decision. We never want to go back to an interior room! If you can afford it, a balcony room is entirely the way to go. We didn’t spend a lot of time in our room, but when we did, our balcony door was almost always open. The ocean breeze was so relaxing to me. Several nights we grabbed late night snacks and drank wine on our private terrace. We were also able to watch the boat dock every morning with some gorgeous views, especially porting into Venice. This experience was unforgettable. Our cruise ported out of Barcelona, Spain. One of the things I regret about this trip is that we were not able to spend any actual time in Barcelona. With the cruise being 12 days, we were already taking two weeks off of work, and we were not able to extend our trip any further. I always recommend taking an extra day before or after the cruise to explore the port city. The first stop on our itinerary after leaving Barcelona was Villefranche-sur-Mer, France, which is 20 minutes east of Nice. This town was picturesque. We docked right next to a little beach, filled with cobblestone streets, colorful restaurants and shops. We did not book a tour here, so we spent our time perusing the area and then proceeded to hop the train about 40 minutes to Monte Carlo. We met a couple from our hometown our first night aboard the Equinox and bumped into them on the train ride to Monte Carlo. We ended up exploring Monte Carlo together, as well as the rest of the cruise destinations. Monte Carlo was preparing for a Rolex race, so many of the streets were blocked off. We tried to take a bus around town, but traffic was horrendous. We made it two blocks in about 30 minutes. The four of us decided to walk around the city the rest of the day, which worked out well. We got to see the Monte Carlo famous casino, a beautiful garden, and some shops before heading back to the ship. The next three days we spent cruising around Italy with full day stops in Florence, Rome, and Sorrento. I had already visited both Florence and Rome a few years back and spent a ton of time exploring many of the museums, which I wasn’t interested in doing again. Eugene is also not a big museum guy, so this worked out. We decided to do Florence on our own instead of booking a tour. The central part of the city is super small and easy to get around, so this ended up being fine; however, getting there was terrible. The port for Florence was a good 2 hours away from the heart of the city. We had to take a bus and two trains to get there; it was pretty stressful as not many of the locals spoke English, but we made it. Honestly, we did regret not booking a tour in Florence only because of the hassle we went through getting there. Another option would have been a taxi, but that would have been extremely expensive. Once we got into the city, we spent the day filling up on pizza and gelato while taking in the historic sites like the Ponte Vecchio, a famous bridge with jewelry shops and the legendary David marble statue. Florence has many jewelry shops throughout the city, as well as several stores to purchase leather and designer goods. Italy is known to have some of the highest quality leather throughout the entire world, so this is definitely a great place to do some credit card damage! The next day, we booked a walking tour of Rome through Celebrity. The ship docked about an hour from the city of Rome, and the tour included bus transportation into Rome. The bus was much more comfortable than our adventures into Florence. The walking tour was about 3.5 hours and stopped at many historical places like the Roman Forum, St. Peter’s Basilica, Trevi Fountain, Pantheon, Sistine Chapel, Spanish Steps, Piazza Navona and several others. We ended up skipping the last part of the tour which included time for the Vatican museum, taking a cab to the Colosseum instead. I had spent some time at the Vatican museum several years back and it was extremely interesting, but I would personally recommend it only if you have several days in Rome versus just the one day that we had on the cruise. Instead, we wanted to see as much as we could in the several hours that we had. Once we got to the Colosseum, we opted out of the interior tour based on time. After my previous experience with the tour, I wouldn't recommend it, as it was long and a tad bit boring--at least our guide was. I love the history of this ancient city, but some of the tours are incredibly lengthy and detailed. I prefer a quick historical overview versus an entire 2-hour lecture. Rome has a lot to offer. I'm glad we were able to hit on some of the essential parts. Being from the US, we don’t have anything to compare to the historical monuments that make up Rome, so it is always mesmerizing to be in the presence of such history. The Amalfi coast, specifically Sorrento, a city in Naples was our next stop after a full day in Rome. The town is set on soaring cliffs, overlooking the Gulf of Naples. Sorrento is recognized for its lemons and limoncello, a lemon-flavored liqueur. In fact, lemons grow on many trees throughout the town, and many stores offer free samples of limoncello--be prepared to get tipsy. We did have a tour booked here, mainly for the transportation. The tour stopped at an antique furniture store and allowed free time throughout the city. Sorrento is small and easily walkable. We visited the markets and strolled through town trying many samples of limoncello and taking in the beautiful views of the city. The market was one of my favorite spots in Sorrento. It was filled with shops and fresh fruit stands, as well as several restaurants. After six days of traveling, it was time for a day at sea. We spent the next day lounging on the sundeck and relaxing near the pool. Since the cruise was in late May, the weather was warm, but not hot. I managed to get a sunburn regardless. Our next two days were spent in Greece, stopping in Mykonos and Athens. Once we arrived in Mykonos, we used tender boats to get to the mainland. The white roofs and blue streets were exactly like in the movies. I was itching for some beach time, so we stopped at Elia Beach for a few hours, soaking in the rays. The water was too cold to enjoy, but we did grab a delicious Greek lunch a few steps from the beach at the main restaurant. After a few hours, we headed back to town to stroll the streets and explore the area. Mykonos is made up of small cobblestone streets, full of turns and hills. I would love to come back and spend a week in Mykonos and maybe even pop over to Santorini. We arrived in Athens the next day; this was probably my least favorite stop of the trip. In my opinion, there isn’t much to see in Athens besides the Acropolis. We had colder weather, so we were a bit miserable walking around. I also ended up catching a pretty lousy cold here, which didn’t help matters. Our favorite stop out of the entire trip was Turkey. Our ship ported in Kuşadası, which is a resort town on the west side of the country. Instead of traveling to the ancient city of Ephesus (where most of the tours go), we decided to do something different and booked a day trip to a small village in the mountains called Şirince. The tour offered a unique perspective into everyday life in Turkey. The drive itself was worth it! We passed olive trees, drove through gorgeous mountains and had some beautiful views of Turkey. Before heading into town, we had lunch at a local restaurant, enjoying some delicious Turkish food. Şirince has a lot to offer, from the local markets and shops to its winery and fantastic food. This tour was a great way to experience the culture of the area. Our group spent time walking through town and visiting a mosque, school, and winery. We also stopped at the local markets, where crafters were working and selling goods. One thing I love about Turkey is the prevalence of evil eye amulets everywhere! Many cultures believe in the evil eye curse which is an evil glare cast by a jealous person. The evil eye is said to bring bad misfortune, luck or even injury to the directed person. Many believe in wearing the evil eye as jewelry or displaying amulets in their homes to ward off the evil and provide protection. Evil eyes were hung from trees and cemented into roads throughout the area. Everything about our day was fantastic. Turkey is definitely a country I would love to come back and visit again. My parents have visited southern Turkey many times, for more of a resort style vacation, which I would very much like to do. Our second to last stop was Dubrovnik, Croatia. I did not realize how much beauty exists in this city. WOW! We rode the Dubrovnik Cable Car to the top of Srd Hill to take in views of the Old City, the Adriatic Sea, and Elaphite islands. The rest of the day we spent walking and shopping through the Old City. There are a ton of tourist trap restaurants within the walls of the Old City, but our friends had recommended that we eat at Restaurant Dubrovnik. It was a hike to find as none of the locals had any idea what we were talking about, but we were able to find it after all. The restaurant is tucked off a small street with little to no signage. We had some of the best food on their rooftop. The service was 5 star! Our stop in Dubrovnik was short, but again another place I would love to visit again. To close out our 12 days of sailing, we spent our final day in Venice. Docking into the city took a little over 2 hours as the ship had to go extremely slow not to flood the other smaller boats around. The captain invited the passengers onto the top decks to watch the docking, but Eugene and I decided to drink champagne in our room and enjoy the view from our balcony. The pictures we took look fake! The scenery was just jaw-dropping. Venice is such a charming city, with so many historical landmarks like Piazza San Marco and Saint Mark’s Basilica. We decided to do a gondola cruise to the Grand Canal, which was pretty expensive, but definitely a must while in Venice. The heart of the city was super easy to walk through, so we didn't do any type of formal tour. Our ship stayed overnight in Venice, allowing us to spend some of the evening in the city as well. Overall, we spent 12 days non stop touring, walking and exploring. We were able to try cuisines from 6 different countries and experience so much history, in such a little time frame. It was an exhausting and exhilarating experience, one that I would recommend 100% to anyone! Thanks for reading! Please comment below and let me know if you've ever been on a cruise and what your favorite stops were! Great info! Thanks for sharing your personal pix!